Life has been a bit insane. I have been teaching at a college, teaching my 3 children, taking a class, getting sick, getting my children well, helping keep my mother-in-law on track with healing, and sometimes the walls close in. I don't get nearly as much time to do what I want to do, and feel like I never quite get caught up. It is MUCH farther along than this. 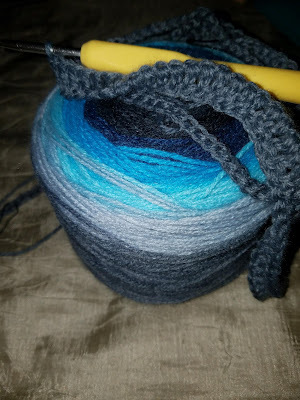 I am using the Cozy Stripe Afghan pattern from Attic24 with self-striping yarn. It's an easy, fun crochet. Knitting is kind of on the back burner at the moment. I have a project that I want to start, and one I need to finish. I am almost done with my Milkrun Shawl, but the last ruffle I had planned to do, and started, I need to take out. There just isn't enough yarn. So, I can remove it and be done. My project list is slowly diminishing, but much like reading, I can never get as much done in an hour as I think I can. My book list still sits, unread. And it has grown. I have added 2 titles to it, but haven't started on any of them. How was your summer? Are you looking forward to fall?